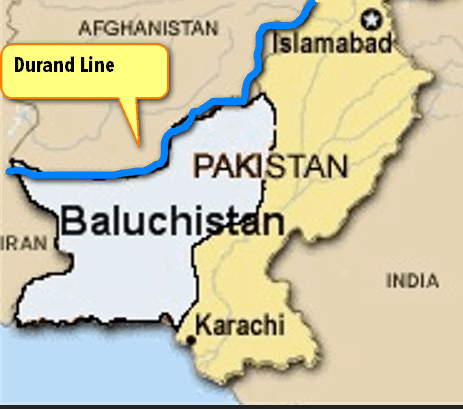 Why is Durand Line in news? Gwadar Port= Strings of Pearl? The 2,600 km border between Pakistan and Afghanistan. This line is named after Sir Mortimer Durand, the Foreign Secretary of then undivided British India. He negotiated this border with the King of Afghanistan. At the end of 19th Century, the Power of Afghani king had declined so he had no choice but to accept it. Fast forward to 1947, India-Pakistan gain independence. But Afghans refuse to recognize Durand line as the international border between Pakistan and Afghanistan. In 1947, at the UN General Assembly meeting, Afghanistan even cast a vote against the admission of Pakistan to the United Nations. Recently, a top US diplomat said that Durand Line constitutes the “international border” between Afghanistan and Pakistan. This has annoyed the Afghan Government. Afghanistan Durand Line does not have any legitimacy.We reject the statement made by USA. Pakistan Durand Line between Pakistan and Afghanistan is “a closed and settled issue”. For gaining support of Pakistanis during Cold war, US sided with them on Durand Line issue. Although this silence is widely interpreted as supporting Pakistan’s position. otherwise, UN could play a major role in settling the disputes between Afghanistan and Pakistan. It may be worthwhile for India to signal that we do not necessarily recognize the Durand Line. Why? Because, to this date, the relations between Afghanistan and Pakistan are characterized by rivalry, suspicion and resentment. The primary cause of this hostility rests in the Durand Line Agreement. India can use it to deepen friendship with Afghanistan, by taking their side on Durand issue. But Indian Foreign policy prefers to stay away from all political risks, therefore very unlikely. Baluchistan is one of the four provinces of Pakistan. It is the largest province by area, but smallest by population. Mohd. Ali Jinnah tried to persuade the Baluch king to join Pakistan, but the Baluch parliament refused it. Anyways, later on the Baluch people started independence movement against Pakistani rule, leading to insurgency, armed struggle. But how does Baluchistan issue connect with Durand Line? Afghan Government takes very assertive and aggressive stance. (just like China over Tibet issue). Afghan armed forces may launch some campaign to reclaim the territory. Taliban commits acts of terrorism within Afghanistan = keeps President Hamid Karzai’s Government occupied with domestic trouble. Pakistani Government has built a port @Gwadar, in Baluchistan coast, with the help of Chinese engineering expertise. Gwadar is located only 180 nautical miles from the Strait of Hormuz. This port would enable Pakistan take control over the world energy jugular and destroy Indian tankers (in case of war). Earlier, All Pakistani Naval ships were concentrated @Karanchi port. Indian Navy could easily attack them and block Pakistani trade. The Baluch rebels are opposing Gwadar port. They say Gwadar Port hasnot lead to any economic Development in the region, all the port-jobs are given to the migrants from Punjab and Sindh province. There have been reports of rebels attacking Chinese engineers and workers. (and Pakistan claiming that RAW had hand in it). Gwadar port a part of ‘String of Pearls’ strategy of Chinese where they’ve got hold of strategic ports in Gwadar, Bangladesh, SriLanka, Burma, Thailand, Combodia, and South China Sea etc. On a world map, these ports form of string (of pearls) which may form as Chinese line of defense to control oil movement. Although China has always denied that Gwadar will ever be used by Chinese military. Publicly China has always called it a civilian port of Pakistan. Iran is barely 72 km away from Gwadar port. Iran feels that Gwadar port (Pakistan) will take business away from Iranian ports. This will provide India the shortest route to Central Asian markets and will be a counter balance to Chinese influence in Gwadar. 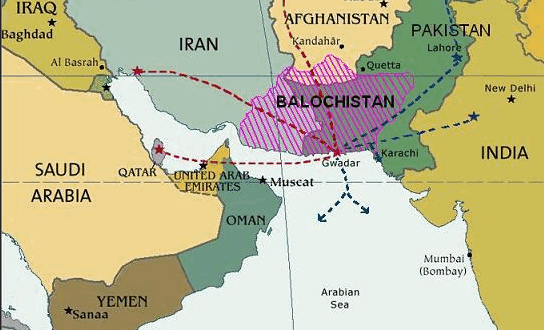 Islamabad has always claimed that the Baluch resistance is been backed by India. But that´s just fake propaganda from Pakistani state media in order to show the world that the Baluch are proxies. India is not supporting us. Baluchs are basically secular, by their culture, by their tradition, by their historical background, so the Pakistani regime is trying to Talibanise the Baluch society. Just where I am right now, the ISI – the Pakistani secret service – has set up two religious militant groups against the Baluch national struggle. They have formed these groups in the name of Islam but their real aim is to crush the Baluch freedom movement. The Taliban are basically Pakistani military without uniform. They started beheading westerners after 9/11 but we were being beheaded by these religious butchers long ago. We have told the International community about the evil plans of the ISI – the Pakistani secret services – but our plea has been stubbornly ignored. An independent Baluchistan would not only be good for us but also for the rest of the world. As we are secular people we would not allow extremism coming from Pakistan, Iran or Afghanistan. Pakistan’s Prime Minister Yousuf Gillani has even spoken about conducting a referendum in Baluchistan but, tell me, when the French, the English, etc pulled out from their colonies, was there any referendum at all? We’re also a colony so Pakistan should leave without any pre-conditions. 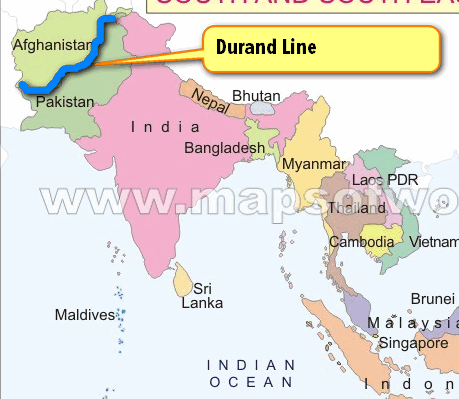 Durand Line separates India from Afghanistan. 38th Parallel separates North Korea and South Korea. Gwadar port is located in the Arabian Sea. Do you think we should help Baluchistan gain independence, like we did to Bangladesh in 1971? Apart from Bangladesh, do you know names of any other countries that gained independence with the help of “foreign powers”? If Baluchistan gains independence, what will be its implication on the International Power equations? there used to columns of folder in left side of dis website .. dese days i can’t find that .. ?? Is this sufficient from ‘The Hindu’ perspective..? I must say i it is not enough for CA. I am already a Civil Servant posted in UP,your articles are always to the point.The best part is that you also provide Questions & Reference so that we can always enrich our knowledge in accordance to requirement. u r a civil servant and still ur nick is iitbhu, that shows u r student there…stop boasting. sir, there is too much of data available but what to read and what not to read pls give a brief guideline and how much in depth one topic should be covered pls explain this also. it is so much useful for civil service aspirants,thanks dude! Sir,impressed……………this z the real contribution to student community inparticular. I found other sites for Current affairs but all those are just copy n past from newspapers without clarify actual background and facts about that topic or news. “Even tom n deck can do copy n past” what is a big deal? But here (Mrunal.org) I found the knowledge and actual facts about the Current News or topic which does not require any other source for CA. The way you explain the news and topics and on top of that related question which might we will find in upcoming UPSC exam is highly appreciated. mrunalji ,it is good article.i have got some clarification about durand line and beluchisthan. Kindly visit following website and please update your information. See third photo and its description. There are so many speculations about change in the trend of CSM. I mean regarding common pattern for all. Please tell me,when this new change may happen in your views. Please explain what is National Investment Board and why there is so much controversies about it? national investment board was setup to disinvest government share in PSU’s. controversy is regarding the money that we get after disinvestment, which should have gone to consolidated fund of india. But our govt. has somehow changed that rule and made a seperate account for money we get through disinvestment. Now, there are more chances of leakages and misuse of this money under the garb of so called social security schemes. sir, how to prepare indian diaspora? please give me guidence . i m an elect.engg nd i want to become I.P.S Officer . so plz guid me from the begainning wat to start first . In Afghanistan, Abdur Rahaman was made the Amir in 1880. British had accepted the policy of disintegrating the Afghans and accepted it as a Buffer State between the two countries. The advocates of a British forward policy in Afghanistan and on the N-West frontier of India regarded “Herat” as the gate of India. But British still retained the rights to handle the foreign relations of Afghanistan. In 1885, a military skirmish occurred and the Russian encroached the Merv Oasis and an Afghan territory south of the Oxus River around an oasis at Panjdeh. (It is now in Turkmenistan). Thus the occupation of Merv placed Russia in a easy striking reach of Herat. So, this was a great alarm for the Russophobes. Immediately negotiations were opened between London and St. Petersburg. A possible war was averted with diplomacy and Lord Dufferin managed to secure a settlement. As per this settlement Russia kept the Merv Oasis, but relinquished further territories taken in their advance, and promised to respect Afghan territorial integrity in the future. Later, in 1893 during times of Lord Lansdowne, Abdul Rahman accepted to let a mission headed by the British India Foreign secretary, Sir Mortimer Durand, demarcate the territories as joint Afghan Frontier Commission. This was the birth of Durand Line, which now defines the territories of Afghanistan and Pakistan. 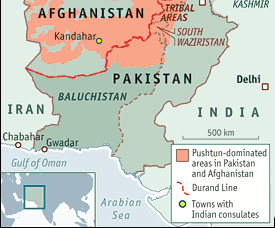 Durand Line is also known to have established the “Great Game” buffer zone between British and Russian interests in that region. The Durand line agreement carved out of a new province called North-West Frontier Province (NWFP) out of annexed areas from Afghanistan. They are currently part of Pakistan but Afghanistan did not recognize them. In 1895, Afghanistan’s northern Border was fixed and Guaranteed by Russia. sir, i have completed my 10th in the year 2002, 12th in 2005 and graduation on 2012 from science stream. I don’t have any other qualification and experience. Sir i want to do MBA from the best B-Schools.Is this good for me or not. Sir i want to do a good job. Sir plz tell me which is correct for me MBA or other and for that what should i do. Sir plz reply me. Hello Mrunal please write abot U.S. ELECTION SYSTEM..???? I guess 2,3 and 4 are correct ? Sir, wonderful article presented by you, yet again. Just one thing though. You said that India should take stance against Pakistan and side with Afghanistan on Durand line. but sir, if we do that then don’t you think that this will weaken India’s stance for accepting McMahon line which demarcates Arunachal Pradesh from Tibet. The international community will view it as hypocracy on part of India. hahaha yes, that angle is worth considering. But this is what Foreign Secretary Shyam Saran believed…..
….Sections of the Indian strategic community feel India is too passive on the disputes between Kabul and Islamabad. Former Foreign Secretary Shyam Saran has underlined the virtues of Indian diplomatic ambiguity on the Durand Line. “It may be worthwhile for us to signal that we do not necessarily recognise the Durand Line as a legitimate frontier between Afghanistan and Pakistan,” Saran wrote about two years ago. For a New Delhi that shuns all political risk, that might be too bold a course. I m not net savvy since i never find anything as accurate & easy to understand, as is provided by you.Thanx a ton,Sir.